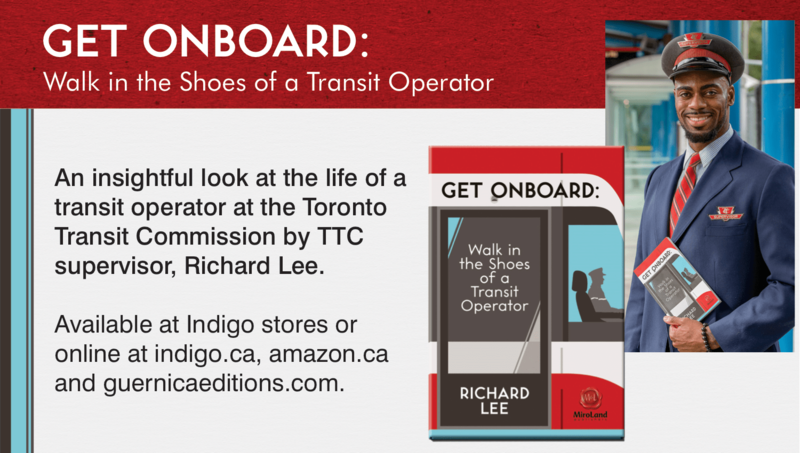 Richard Lee’s “Get Onboard: Walk in the Shoes of a Transit Operator” to be launched this Sunday in Spadina Station! This Sunday, stop by Spadina Station for one of the most unusual book launches we’ve had! Richard Lee’s Get Onboard: Walk in the Shoes of a Transit Operator will be being launched at the rotunda of Spadina Station this Sunday October 18th from 7 to 8:30 PM. There will be refreshments, music, and books for sale. Richard will be reading from Get Onboard, followed by other TTC operators speaking about their experiences. Stop by for some light refreshments, and a signed copy of Get Onboard: Walk in the Shoes of a Transit Operator! Richard Lee’s Get Onboard: Walk in the Shoes of a Transit Operator draws on the stories of TTC operators, and the physical and mental stress caused by this occupation. This story is paralleled with the author’s own personal story, of a broken family home, abandoned teen dreams and a desperate need to be loved and appreciated. In spite of the author’s personal demons, and the daily abuse he faces from the public, he manages to overcome these obstacles by deciding to be the best at whatever he does. Tagged with Get Onboard: Walk in the Shoes of a Transit Operator, Richard Lee, Spadina Station, TTC.